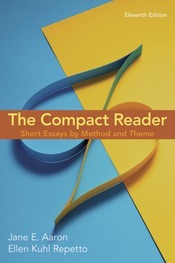 The Compact Reader offers an innovative dual organization; it can be taught rhetorically or thematically. Each rhetorical method is paired with an engaging thematic topic so that readings display the full range and flexibility of writing in each mode. Selections average just two or three pages in length, so that students can read them quickly, analyze them thoroughly, and emulate them successfully. A brief guide to reading and writing, detailed chapter introductions, and two final chapters on working with sources serve as a mini-rhetoric, providing students with the support they need. For instructors who want a concise, affordable, effective resource for teaching the connection between form and content, The Compact Reader is the perfect choice.